Though I haven't tuned in enough to follow the storyline, I do know that AMC's wildly popular Man Men series is known for two things: juicy plots and haute vintage style. I'm sure I'm not the only one who's noticed glossy spreads featuring Mad Men-inspired, ladylike looks in season's past - so huge kudos to Banana Republic for collaborating with Mad Men costume designer, Janie Bryant, to create a modern take on the effortless 60's style that's captured weekly on the award winning show. There's definitely lots to love in the Mad Men collection and so many of the pieces transition nicely from work to evening attire which I think is key. There's no need to buy work clothes that can't go double duty -- unless of course you're a uniformed professional. Think hints of leopard print, sweet bow blouses, high waisted skirts and form fitting shift dresses among other styles of decades past that we can't get enough of today. The accessories are very Audrey Hepburn (or I suppose Betty Draper) featuring retro necessities like fantastic silk blend scarves, neatly rounded toe pumps, wool fedoras, and oodles of pearls. Banana Republic accessories tend to start around $50 so they're a little more of an investment, but the costume pieces are always really great quality and the styles are timeless so you know they will be worn again and again. This collection is all about the dresses, which is totally fine by me. The demure necklines, retro silhouettes and interesting textures made it really hard to choose a favourite. One to watch for fall soirees is a brick coloured, full-skirted, cocktail dress in taffeta. I wouldn't hesitate to wear it with the faded leopard trench it's displayed with. Meow! The little black dress on the right was also a favourite due it it's lacy hem. Dresses are priced around $185 and the trench at $240. More dress loveliness...I drooled quite a bit. Beyond the dresses, and these are just a few ladies, the separates were equally enchanting. I loved the bow blouses and tweed skirt suits that reminded me so much of my corporate days. 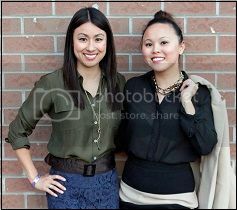 The Banana Republic PR gals looked fabulous in their Mad Men pieces so I had to take a quick snap. Thanks ladies! The hip urban guys in your life also luck out with plenty of Mad Men style featuring tailored suiting, separates and even accessories as demonstrated by the dashing Don Draper at right. Do take note of the sheath on Betty. It's navy houndstooth, and it's amazingly chic. The Banana Republic Man Men collection is in-stores and online for your shopping pleasure now! If there is one item I'd buy today it's this fuzzy mohair blend sweater in a muted leopard print priced at $110. Throw it over your barest summer dress and combat the office A/C and sport it well into holiday season with some sparkle (perhaps with the aforementioned taffeta dress) and It'll take you through 2011 and beyond with mad hot style. --Tamika Auwai is fashion junkie, splurge-a-holic and founder of Shop Socials. I bought the black lace trim dress. It is the first thing I've ever bought at BR because their stuff is usually not designed with hourglass figures like mine. The fabric is a kind of glossy linen. Beautiful and flattering.